The 10 Hole Diatonic Harmonicas are new and unused. Really nice Hohner Special 20 in the key of D in near mint condition.The Hohner Model 560 Special 20 was one of the first diatonic harmonicas in the world with the reed plates recessed into the comb, creating a projecting plastic mouthpiece. The perfect starter set! 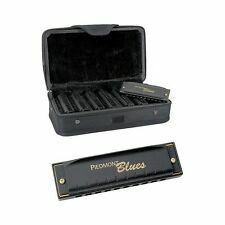 The Hohner Piedmont Blues Set includes seven harmonicas plus a handy zippered case to take the whole set with you. 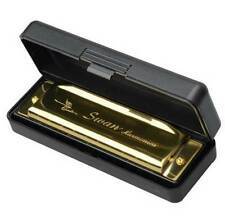 Each harmonica features a matte black finish with eye-catching gold trim. 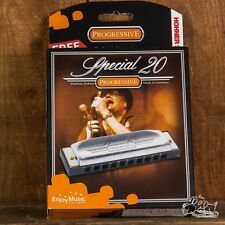 These 10 hole harmonicas feature brass reeds that sound great for blues, folk, rock or country music! On the back of the reference chart are directions to play "sittin on top of the world" to help put the harmonicas to use for new players. Hohner Collector's Edition Remaster Vol. 3 German Diatonic Harmonica in Key of C. Hohner Collector's Edition "Remaster" Vol. With their excellent response and great tone, diatonic harmonicas from HOHNER have earned a worldwide reputation for the finest quality. Hohner Collector's Edition Remaster Vol. 1 German Diatonic Harmonica in Key of C. Hohner Collector's Edition "Remaster" Vol. With their excellent response and great tone, diatonic harmonicas from HOHNER have earned a worldwide reputation for the finest quality. Hohner includes a Bb harp for playing cross-harp in the key of F—a favorite key of harmonica greats like Little Walter. Keys: G, A, Bb, C, D, E, and F (lowest to highest). If you’re not satisfied, neither are we. Perfect for the seasoned harpist or those who are just starting out, the Fender Blues Deluxe Harmonica is versatile enough for any level of player. 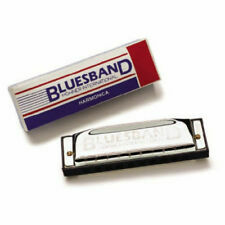 NEW - FENDER BLUES DELUXE HARMONICA. Item Pickup. Other alphabets (Cyrillic, Japanese, Chinese, etc.) will not be translated and your item will be delayed. YONBERG STORM HARMONICA. The SEYDEL stainless steel reeds made specially for Yonberg last 5x longer than conventional brass reeds. Black is the standard color of your Yonberg harmonica. Other comb and cover colors are are available. Lee Oskar Harmonica – Major Diatonic “C”. Throughout the history of Piedmont Blues, HOHNER harmonicas have been found at the heart of this musical style in the hands of players like Sonny Terry, whose sophisticated sense of rhythm is still a marvel to behold. The etching on the harp is done to look similar to the pouch. A great harp for starters or those who have been playing for years. Will include free 47 page instruction pocket booklet. Small enough to carry with you for easy reference. Hohner Special 20 key A Marine Band Blues harmonica great condition with an original Hohner light brown hard case. The harmonica had been disassembled and Detailed Cleaned. They buy and you play and no need to worry about cleaning. 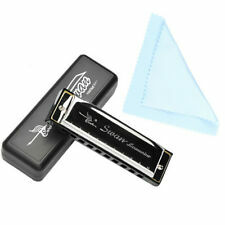 Suzuki Promaster MR-350 10 Hole diatonic harmonica; Key of C; includes plastic hard case. I just bought thousands of Harmonicas on a great blowout deal from Hohner. These are not obsolete, defective or problem models at all, it is just that Hohner custom made this model for a National Science Museum who cancelled the order so I bought them all !